A new era for Film and TV production on Maui was heralded on Sept 26th at an open community meeting staged by the Maui County Film Office. Well, maybe. Maui County last year broke records hosting $62 Million in production spending and the recently revamped Film Office has its sights set on growth. Talk is about a destination resort style film production center, and legislative tax incentives to draw feature production here. The meeting drew hundreds of Maui residents, mostly with a common interest: Jobs. Big eyes are always set on large studio productions and everyone was quickly reminded that that’s Union turf when speculation arose over whether a suggested local tax incentive for using Maui-based crew would conflict with the pecking order of more senior Oahu-based union members. Such issues would have to be hashed out and we should all hope to have such problems to deal with. The Film Office’s stated vision is necessarily broader than just studio features and also encompasses independent and local film projects, TV, and all forms of electronic media. All these production fields overlap and support one another and all are necessary to create a Maui production community with sufficient critical mass so as to be sustainable. The Film Office wants to hear about all Maui based production skills and equipment and talk was of launching an all-inclusive, web-based production resource guide so that producers can more easily find what they need on Maui. Union talk again was instrumental in illustrating the critical need to also foster smaller scale, independent production on Maui when discussion flowed to the eternal Catch-22: How do you acquire the skills and work experience and afford to join a union without working union gigs? Maui’s most excellent community access TV station, Akaku, was also suggested as a breeding ground for experienced crew and talent. Akaku was there with a multi camera set–up shooting the meeting and attempting to stream it live on the web. That the internet connection at the community center meeting site could not sustain the video stream brings to focus one of the most restricting aspects of Maui’s still slightly lacking technical infrastructure: Bandwidth. People think Maui, like most established communities in modern America, enjoys robust web connectivity – the sad fact is we don’t. Think Third World, or even worse. One can imagine that a major production facility, if built here, could set up their own satellite connection to send secure dailies to Hollywood, but what of the much needed independent and small local content producers who are currently consistently choked by expensive yet insufficient and unreliable bandwidth? Akaku and the rest of us suffer from the simple fact that broadband delivery in Hawaii is a virtual monopoly controlled by a single provider who has no motivation to upgrade their infrastructure. Akaku could easily increase their production output substantially but they can’t reliably and affordably stream their programming off the island and onto the web. Hundreds of municipalities across America have realized that commercial service providers will never provide the cheap, plentiful and reliable Broadband they need and have taken it upon themselves to build their own municipal systems. Time Warner recently successfully lobbied North Carolina state legislators to outlaw the practice in that state and the same could happen here. So, how is a necessarily diverse, healthy Maui-based production industry ever to grow and become the global player that its geography affords, if we don’t have broad access to Broadband? 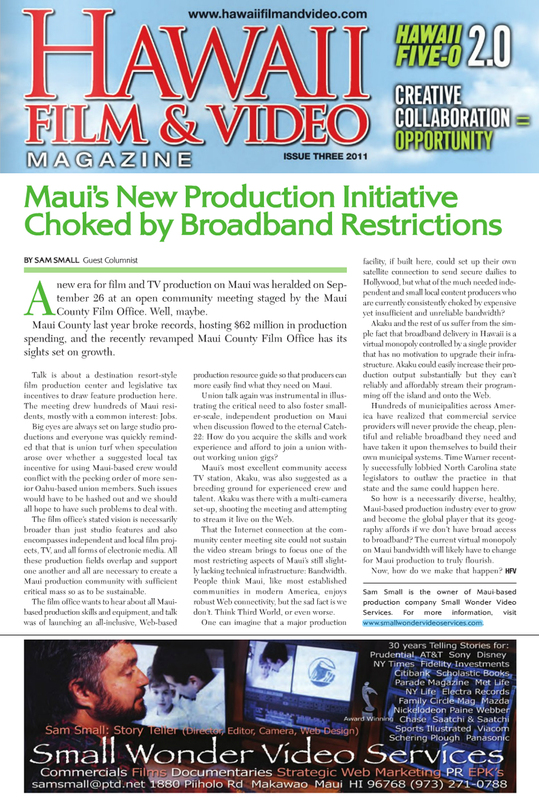 The current virtual monopoly on Maui bandwidth will likely have to change for Maui production to truly flourish. Now, how do we make that happen? To counter this trend municipalities from building their own systems. Since Governor Abercrombie announced his 1 Gigabit Broadband initiative for all school by 2018, to be achieved through public/private partnerships, its easy to imagine that Time Warner will try to do the same here soon. Anything to protect their monopoly, at the cost of the people of Hawaii and the success of media production on Maui. systematic strategy of the past Governor who tried for years by any means available to shut the station down. Governor Abercrombie, like a breath of fresh air, has publically pledged to support the station, but the internet issue has yet to be healed. Akaku could easily increase their production output substantially but they can’t reliably get their programming off the island and onto the web. municipality community hearing son a state gigabit to build our own.